Welcome to our up to date blog of the 2014 All Inland Inter Provincial & Mpumalanga Club Championships at Sodwana Bay. We’ll be updating you regularly on the goings on at the competition as the crew of Grande Pé fishes from May 5th to 9th. As promised, here are the final results of the OET Club Championships held in May at Sodwana Bay. Points: 300 points; released blue marlin day 3. Anglers: Lieb Grabie, Johnny Venter, Johnny Venter Jr & Ernest Venter. 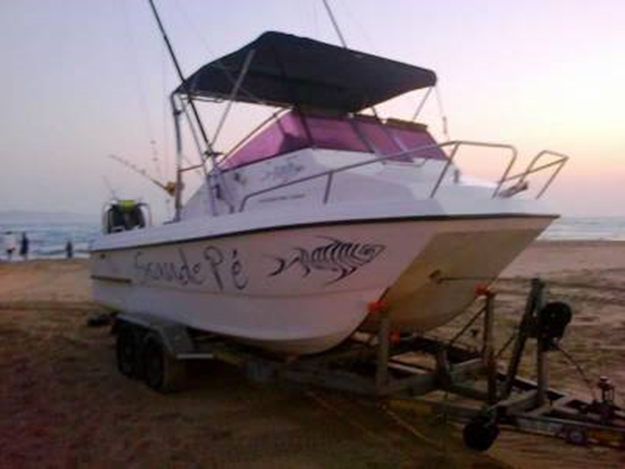 Anglers: Lise Smit, Gert Conradie & Lionel du Preez. Anglers: Francois Visagie, Renier Slabbert & Stefan Kleinhaus. Anglers: Lappies Labuschagne, Bakkies Bohmer, Kobus Engelbrecht & Jan Joubert. Anglers: Sarel Allers, Craig Smith, Wessel Grimbeek & Herman Wepener. 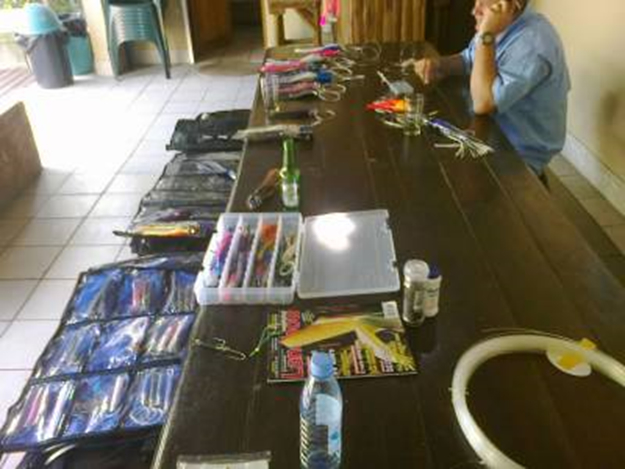 Anglers: Marthinus Oosthuizen, Johan van Heerden, Willie Clarke, Gerrie Human. Posted on Monday 12 May at 09:18am: The 2014 All Inland Inter Provincial & Mpumalanga Club Championships at Sodwana Bay came to an end on Friday 9 May. Full results for the competition will be posted as soon as they become available. Posted on Thursday 8 May at 09:02am: The weather improved a lot since Tuesday, and the teams managed to get some fishing time in. The guys aboard Grande Pé got one skipjack yesterday and rigged it for live bait. They had a bill fish hit but no hookup. Posted on Tuesday 6 May at 13:43pm: Not much else for the guys to do today but get some rigs built before the fishing hopefully gets underway tomorrow, and make sure dehydration doesn’t set in! Posted on Tuesday 6 May at 08:39am: Well it seems like there won’t be any fishing today either. Conditions have not improved enough, and the officials have deemed it unsafe to go out to sea. Hopes are high that the teams will be able to get some fishing done tomorrow. Posted on Monday 5 May at 11:31am: Despite the blow-out on day one, the chaps on Grande Pé had a bit of excitement hooking into a Blue Marlin early in the day. Unfortunately, the fish that fell for a pink softhead smoker, wasn’t on long enough for Werner to even get strapped in before it became unbuttoned. Next time! Posted on Monday 5 May at 11:03am: Some not so good news for the guys fishing the 2014 All Inland Inter Provincial & Mpumalanga Club Championships at Sodwana Bay. The boats have been called off the water due to unsafe weather conditions. Near gale winds of 16m/s forced fishing to come to a premature end. However, conditions are predicted to improve slightly tomorrow, with very light breezy conditions expected by Wednesday. Posted on Monday 5 May at 10:06am: Launch time. It was an early start this morning for Peter Zonneveld, Werner Wessels (both of Angling & Outdoor World), Dolf Botha and Marsel Slabbert, who are representing the Nelspruit District Angling Club (NDAC) at the 2014 All Inland Inter Provincial & Mpumalanga Club Championships at Sodwana Bay. ← Don’t skimp on your fishing line!